The Crain’s article focuses on Thor Equities’ Joe Sitt, the land speculator who has been buying up Coney’s amusement acres. The article credulously reports that “Mr. Sitt is locked in a battle with the Bloomberg administration, which plans to develop the depressed area into a thriving year-round amusement district with housing” and says that to that accomplish this the city “needs the 10.5 acres that Mr. Sitt assembled over seven years at a cost of $93 million.” For reference, those acres the city wants are acres that are zoned for amusements which the city, in its plan wants to use for amusements. So what’s happening that causes the main point of the Crain’s article to be that the city has reportedly offered to pay Sitt (a rejected) $105 million just so that the amusement acres will be used, as intended, as zoned, as they should be, as amusement acres? [The] pace of disinvestment and loss of amusements has accelerated really deeply in the last four or five years with speculative land transactions that have gone on. 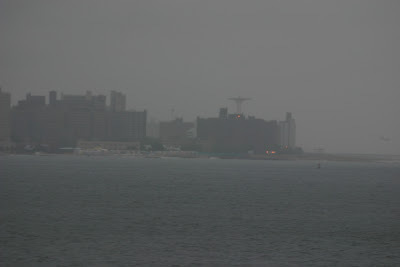 It started about five years ago with the formation of the Coney Island Development Corporation and the mayor’s strategic plan that was issued for Coney Island. Since that time the city and its partners have been engaged in a very intensive outreach at the community level to local stakeholders, with property owners, with amusement operators . . . The trouble is also this: As Crain’s ought to have recognized, an unbelievable Mr. Sitt does not make for a believable Bloomberg administration. Perhaps the one thing that ought to give us the most hope about Coney Island’s future is that Coney is so beloved that no one wants to admit they don’t want to save and improve it, not even those like Sitt and the city, who are currently responsible for so much of the recent destruction befalling Coney. Nobody actually wants to take responsibility for Coney’s destruction. So, how exactly has the city been working against itself at the bargaining table and driving up the cost of preserving amusement acreage at Coney? The possible conversion to such other use is the basis of Sitt’s speculation. It is the basis for the very high sums Sitt is demanding from the city in order for his amusement acres to be restored to the amusement use for which they are currently zoned. Sitt can speculate, but that doesn’t mean that he is entitled either to a zoning change or such high sums- - But the city has played into his hands with its plan to shrink the amusement park. All else being equal, the value of Coney’s amusement acres should be the value they have for continued amusement use. In fact, recognizing this is critical to the economics of keeping the Coney amusement area alive. As we said, the converse of this, a zoning change, or an increased price is not something Mr. Sitt or any other land speculator is entitled to. Similarly, without such a condemnation process to set value, real market value is based on a game of political probabilities as to whether land will be rezoned. Though no one is entitled to a rezoning of their land, everyone is entitled to pursue political process to have that land rezoned. To the extent that one believes that a rezoning is politically probable the market value of the land goes up. By announcing (each respective time) that it was going to shrink Coney Island’s amusement acres, the city reset the expectations and probabilities of rezoning in Sitt’s favor. It was now no longer a question of whether Coney Island amusement acres would be rezoned; it was now just a question of whose amusement acres would be rezoned, Sitt’s or somebody else’s. When the city says that Sitt is demanding too much money for the restoration of his acres to amusement use it is therefore decrying a situation of its own making. We are not deluding ourselves: The senate opposition to the city plan (led by State Senators Carl Kruger and Diane Savino) even though characterizing the city’s inept plan as “as pie in the sky” is not about preserving Coney Island or assisting in any serious desire Sitt has for a better Coney Island plan. It is only about assisting Sitt in the political game to get a higher speculative price. But the Albany opposition is something that the city and Coney Island Amusement park supporters can wind up benefitting from. The best thing to happen now would be for the city’s plan to die.. The city has played into Sitt’s hands with its plan to shrink the amusement park. Its best tactic at this point would be to announce that it is not going to shrink the amusement acreage, even to announce that the city plans to grow the amusement acres. Given the changes that have occurred in the economy this is exactly what the city should do. Just what does the Bloomberg administration have on its little mind? Does it think that New York will grow and will it then plan for growth accordingly? 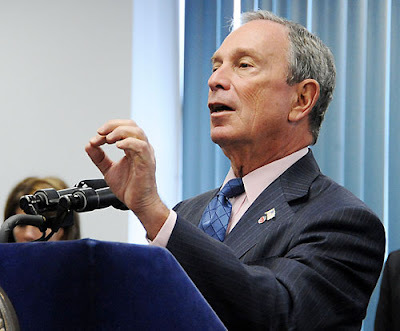 Or is the Bloomberg administration planning for a shrinking New York? We think we can perceive some unfortunate consistency in the Bloomberg administration’s inconsistent answers. Responding to the mayor's pledge in his State of the City address last January to produce a ''strategic land use plan'' to deal with a city of nine million people, Mr. Doctoroff said: ''We have the capacity through rezoning and underutilized land to go well over that number. But you cannot simply divorce the issue of growth from the infrastructure required to support it. City officials declined to publicly elaborate on their proposals in advance of the advisory board's announcement. But some of its goals were foreshadowed by two of the largest rezoning revisions in city history -- of the Brooklyn waterfront in Greenpoint and Williamsburg and the Far West Side of Manhattan -- both driven by Mr. Doctoroff. The two major zoning changes, coupled with other development proposals, including the Atlantic Yards project in Brooklyn, were aimed at revitalizing underutilized land for economic development and expanding the city's property tax base. 2. The shrinking (almost certainly out of existence) of the Coney Island amusement area, New York’s Central Park by the sea? The Coney Island amusement area is supremely accessible to the rest of the city, made so by the investment in a substantial subway infrastructure. Why, in a time of growth, should we be shrinking this park out of existence? There is only one apparent reason: Getting rid of the Coney Island amusement area will allow the Bloomberg administration to turn it over to real estate developers for other purposes- But it will probably be “generations” before that development actually occurs. 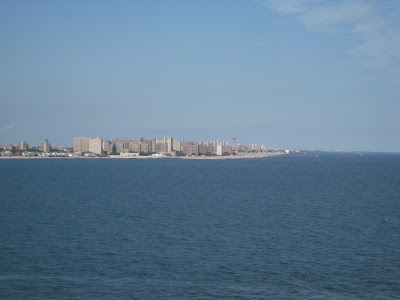 For more of what we have written about this and for information about the City Council hearings scheduled of this Wednesday morning on the proposed shrinkage out of existence of Coney see: Thursday, June 25, 2009, July 1, Wed, 10 am: City Council Hearing on Coney Island Rezoning. Why shrink New York’s infrastructure? Consistency is the hobgoblin of little minds. The Bloomberg administration actually has such a little mind (and apparently little on its mind)- - It is always consistent about one thing: When it comes to the real estate industry and big developers, the Bloomberg administration is always looking for what it can hand out and give away. We don’t want to be instantly negative about something that arguably might have some appreciable positives, especially if we only just heard about it. We need time to think. And taking time to think is what we believe the MTA board should have done when it was proposed (upon 48 hours notice to the board) that the board approve sale of the right to name Brooklyn’s interlinking Atlantic Avenue and Pacific Street subway stations to Bruce Ratner’s Forest City Ratner in connection with the Atlantic Yards Nets arena he is hoping to build. The MTA Board Was Told. . .
Not much. We mean not much information and perhaps not that much money either. The price for a 30-second Super Bowl ad this year is $3 million. Also, in significant contrast, Forest City Ratner sold Barclays the right to name the arena the Barclays Center for $20 million a year for 20 years (totaling $400 million). Although the above description that went to the MTA board doesn’t say so, the information about the subway naming rights deal is that it is also similarly a 20-year contract. In other words, the MTA negotiated a naming rights deal for the subway that is 1/100th the value of the naming rights deal Ratner negotiated for the arena. The first year’s $200,000 to name the subways may seem a paltry trifle, but in 20 years’ time that $200,000 will assuredly be a truly trivial sum to pay for advertising. The price for a Super Bowl ad this year is 11% higher than last year’s (whatever they say about the network television being a fading medium). The price for a 2008 30-second Super Bowl ad year was $2.7 million. The arena would take about two years to build and the notion is that the station names would not change (or payments start?) until 2012. Going back to 1988 we find that the cost of a 30-second Super Bowl ad was only $625,000 to $675,000 (with NBA projecting the 1989 figure at $700,000). Projecting this trend forward, we can estimate that in 2029 the price of a Super Bowl ad would presumably be more than $14 million, at which time the annual payment for naming the subways stations would still be $200,000- 1.4 one-hundredths (or just 1.4%) of that $200,000 amount. . .
. . . Not bad if you are Barclays! 10 million people pass through the stations every year.- By 2029 who knows? Getting Kinda of A Feeling? How did the MTA negotiate handing Ratner the right to put the Barclay name on New York’s Brooklyn transit hub subway stations? WNYC reports that the MTA’s Gary Dellaverson, the MTA’’s Chief Financial Officer, explained: “We kinda felt our way into it.” That may be an understatement: Even as the MTA’s board meeting to approve the deal was underway, an MTA staffer was in the hallway outside the meeting on his cell phone trying to find out exactly what the deal was and what the board in the room next door should be told about it. 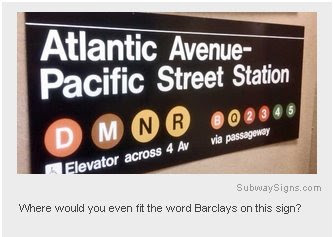 When the board bothered to ask, it was clarified that the right to have the Barclays name on the subway station did not extend to the right to have the Barclay name on the interconnecting Long Island Railroad Station/Terminal. (Could it then still be named something else?) There were obviously a lot of other questions the board should also have been asking. The 20-year contract is the first naming-rights deal for the cash-strapped Metropolitan Transportation Authority, which has unsuccessfully tried to find sponsors for other stations around the city. Board members and staff heralded the arrangement, approved on Wednesday, as a major victory for the chronically underfunded mass transit system. "We’ve been trying to make money off naming rights for quite a while. This is the first time we’ve been successful... It’s a very important point." It sure is an important point. Because all the MTA had to do to be "successful" in selling naming rights to the station for $4 million over 20 years was to throw in development rights to an eight-acre railyard for $114.5 million less than the MTA's own appraisal, reduce the down payment for said yards by 80%, and extend the payment terms by 22 years at a below-market interest rate. With that kind of "successful" sale, we can expect the MTA to be coming back to the taxpayers for another of their own massive bailouts very soon. We have to note that the MTA (and ESDC) are also “heralding” their arena deal itself as if it is some sort of achievement even though the city’s Independent Budget Office has said that it will be a net financial loss for the public and the city’s economy, notwithstanding what a tremendously good deal it is for Forest City Ratner. In its boosterish accounts, the MTA has attempted to inflate the apparent benefit of the subway deal by describing it as a “$4 million” deal. But obviously the present value of $200,000 paid over 20 years starting in 2012 or afterwards is not $4 million. Previously we have not wanted to overstate the $20 million-per-year figure Ratner is getting from Barclays as a “$400 million” deal. Accordingly we have noted that it should be viewed as having a present value of about $187.3 million. Similarly, the MTA’s new deal on a present value basis would be about $1,873,000, still much less than the price of one 30-second Super Bowl commercial. Questions: Why Does Ratner Always Get the Right to . . . There are, of course, those who properly asked why collecting $20 million per year to have Barclays name on the arena was a privilege that was accorded to Ratner since the public was paying to build the arena and it was ostensibly owned by a public authority. There is a convincing argument that the $20 million per annum should be going to the city or a public agency. Now there is another question: The right to name the subway is being sold to Ratner for $200 K per year but it is arguably worth 100 times more and will presumably be passed on by Ratner to Barclays at a markup whose premium reflects the much greater value. How should the value of this additional giveaway to Ratner be calculated? $187.3 million minus $1.873 million= $185.427 million? Subsequent documentation that may later become public is unlikely to make the amount of Ratner’s markup, ($185.427 million or whatever) entirely clear: Some of the markup’s value is likely to be used to compensate Barclays for the fact that Ratner is no longer building an arena by a name architect or an arena that is considered to be high-quality design. There are, of course, ways other than entirely by feel to negotiate such advertising transactions. For instance, there is a service, Standard Rate and Data, that provides a huge amount of information about such things. And, of course, the public can use the MTA’s site to get information about all the opportunities to advertise in transit facilities the MTA has been selling for years. Alternatively, the MTA could refer back to an MTA plan discussed by the New York Times as recently as 2008 to line lengths of New York City subway tunnels with ads. (See: Advertising: The Train Is Coming. And With It, More Ads, October 16, 2008. According to that article it was envisioned that: “It will probably cost around $95,000 for a full month of ads in a tunnel.” The article talked about the short length of tunnel for the Times Square - Grand Central shuttle service. This Practically Means. . . In practical terms, WNYC reports that by selling the right to put the Barlcays name on the station, the MTA “has committed to using to using the name on streets, on signs on maps and on schedules, but they haven’t committed to using the name yet in announcements.” This creates some practical problems. Putting the name on maps and schedule will clutter them. Also, what sort of time lags will there be if the deal terminates? (WNYC reported on how a Boston naming rights deal was simply abandoned by the sponsor.) With stations and maps all labeled Barclays, how long after payments stop is everything put back the way it was and when does the public cease referring to the stations by the Barclays name? 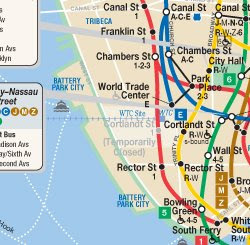 For instance, in terms of lag, the New York City subway map still refers to the “World Trade Center,” which is eight years gone. The idea touched upon by WNYC that subway conductors might be required to announce the Barclays Center is amusing: Perhaps someone has thought of having them sing or play a Barclays jingle when the train comes in? If this is appropriate the MTA could sell off the entire subway system at $200,000 a year per station. Columbus Circle will now be the Columbus Circle/AOL Time Warner Station. Oops- - No AOL anymore, just Time Warner then. Grand Central could be Grand Central/Pan Am Station. Oops- - No Pan Am anymore, Met Life then. Given all the turmoil in the financial world, will Barclays be around for “20 years”? Maybe so. If they have been around long enough to have been involved in the slave trade, maybe it can be argued they will be around for a few more years. The Restitution Study Group, headed by Deadria Farmer-Paellmann, a former Brooklynite, alleges that Heywoods Bank — which is believed to have merged with Martins Bank in the 1800s, which, in turn merged with Barclays Bank in 1969 — took part in 125 slave-trading voyages, enslaving more than 38,000 Africans, more than 6,000 of whom died en route to the Americas. And if a company can pay to get its name on any station, a New Yorker might wonder what’s next: Coca-Cola Presents 59th Street-Columbus Circle? The answer is maybe. Once upon a time, geographic relevance determined a station’s name, but now, the authority says it is open to any naming agreements that can raise revenue for its transit system, including ones not directly tied to location. “It’s not like Taco Bell saying it wants Grand Army Plaza or something like that,” said John H. Banks III, a board member since 2004. A few New York businesses contacted on Tuesday said they were not interested in a piece of the underground. Zabar’s, the Upper West Side food emporium, said it was not interested in the 79th Street station. Macy’s said a sponsorship deal at 34th Street was not in the cards. (* In terms of the likelihood of the arena being built we think that Develop Don’t Destroy Brooklyn made worthwhile points in assessing that essentially there has not been an advance of the project but a rewinding of the clock back to circa 2005-2006 with some additional difficulties for the developer slathered on top. Lawsuits are still outstanding and there are also a number additional factors that make it a more uphill battle for Ratner. Initial approvals for a redesigned project have just been issued, the project is substantially worse than it ever was before, the process has been even worse, opening the public agencies up for lawsuits on multiple grounds that didn't exist before, there has been a political shift pretty much across the board (including those running for various pertinent offices) excluding only Bloomberg, Paterson and Markowitz, the tax code is now explicit that the arena financing is NOT permitted except for a grandfathering of a previously permitted loophole that will close 12/31/’09, the credit markets are rather unreceptive, with especially good reason to be vis a vis Ratner whose stock has gone down to zero and whose debt rating is entirely speculative, there is a scandal on the Yankee Stadium bonds’ underlying real property assessment that may blow up further causing those bonds to be declared taxable which would also make the arena bonds almost impossible to issue in this time frame. We are not, per se, against advertising. We support the sensory onslaught of advertising in Times Square for the joy of its pure garish absurdity. It is something the Municipal Art Society had to fight the city administration to achieve. But the advertising of Times Square, like its unparalleled level of jostling density, can be enjoyed because it is something that can be walked away from and left behind. In other contexts, groups like the Municipal Art Society have worked to constrain, for instance, the clutter of “nasty” newsracks taking over the new York’s city streets or “Billboards Gone Wild.” It isn’t really that long ago, only the days of Ladybird Johnson, that the public consensus was to pass a law preventing the advertising clutter of billboards on our the national highways. Good Governance Reactions? No Chance! With the naming rights deal being sprung even on the MTA’s own board with only 48 hours of notice, groups like the Municipal Art Society were certainly denied sufficient time to weigh in on the issue the station naming rights. We wonder who did. For instance, was the ($185.427 million) subway naming rights for Ratner simply tacked onto the approvals going to the MTA board after it was determined that MTA members would be directed to vote for it, or did Mayor Bloomberg and Governor Paterson actually know this was part of the deal when the MTA members were getting their direction to vote for it? Orr [President Orr of the rapid Transit Commission] admitted that so many signs had been installed that, in the ensuing clutter passengers were having great difficulty locating the terra-cotta and mosaic plaques that announced the stations. Maybe some things never change. And we still have advertisements in the subway. In 1976, in the process of writing a paper in Urban Planning school for Sigurd Grava, our research turned up an interesting little scandal. A central premise of our paper was that proper mass transit information was critical to proper and full utilization of the transit system. When looking at the paucity of subway maps on display in the subway system we discovered that the Transit Authority did not have the ability to add additional maps on the walls of the stations because they had sold all the wall space to a separate independent company that in turn, resold all the space for the posting of advertising. 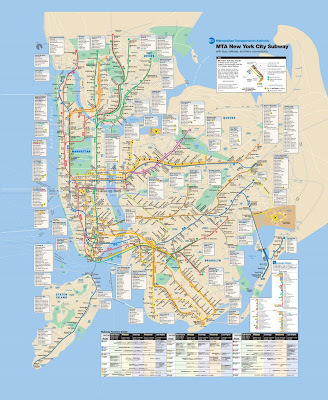 If the public officials running the subway system wanted more maps on the walls they would have been required to buy the space back for that purpose. We remember that the public officials and the company seemed rather defensive of this arrangement. Similarly, on buses, especially the buses that existed back in 1976, the best information system for finding your way, looking out the windows at the street signs, was impeded by advertising. Advertising placards hung low in the corners of the buses: Any reasonably tall individual who was standing while riding the buses had their view of most of the street blocked by the advertising because of the way the buses were designed, putting low-placed advertising placards exactly where windows would have been helpful. 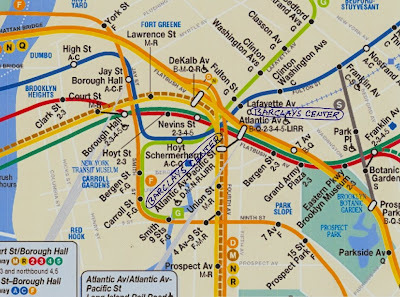 The renaming of the subways stations with the name “Barclays” may not itself create an insurmountable amount of clutter that interferes with the public finding its way at the station but the requirement that the name be put on the subway map is a problem. 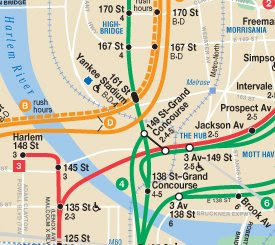 “Yankee Stadium” is on the current subway map. “Madison Square Garden”and a lot of other key sites are not. Even Ratner’s “MetroTech” which has its name on a station does not show up on the map. 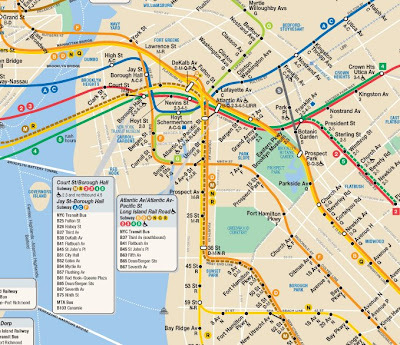 Designing a workable subway map is an exercise in critical economy. There is so little space available on the map and it is essential to communicate the most vital information without allowing the clutter of too much information to blot out those essentials. We know this because we were communicating and conferring with one of the designers of the current subway map as it was being designed. The map is a phenomenal exercise in the careful selection of what is left out and what is put in. The idea that the designer’s right to come up with the best way to present information should be contracted away (for a score of years) for a trivial amount of advertising dollars is preposterous. “Yankee Stadium” and the “World Trade Center” which are both on the current map are on some of the map’s less cluttered `real estate.’ The Barclays Center would be in one of the most cluttered sections, a hub, with a tight confluence of line where a lot of other things are going on. There are also a lot of things going on there in real life. For instance, the Brooklyn Academy of Music shares the same location. Does putting the Barclay Center on the map rate to the exclusion of citing the that the location is BAM’s? In fact, was BAM offered a chance to bid to have its name on the stations? If not, shouldn’t it have been given an equal shot at such cheap advertising? The MTA speaks of the sale of this right to Ratner as the beginning of a program. 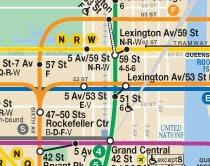 We can just imagine the confusion in trying to find your way when all the important subway stations in the system are overlaid with corporate brand names shifting faster than those in a drug store toothpaste or shampoo aisle. We are not talking about whether anyone remembers Bucky Beaver’s Ipana here: What if the 59th and 5th N, R W stop was named the General Motors Building? Remember “Manufacturers Hanover Plaza”? Manufacturers Hanover merged with Chemical Bank. The resulting Chemical Bank then acquired Chase bank. You can still find One Chase Manhattan Plaza. It has been around long enough to be landmarked though, given the acquisition by the bank could easily now be called “Chemical.” Where are Chase’s headquarters now and what about its threats to relocate? . . while some developers see profit in these location mutations, they are giving headaches to other groups, such as taxi drivers and mailmen. He said location mutation both slowed down mail delivery and drove up costs for the Postal Service, and thus ultimately the public.
. . . in the case of New York, imagine the real estate battles à la Atlantic Yards, the pollution, and the additional public subsidies . . . . Meanwhile, the name Citi Field is fast becoming a joke. Shall we rename it Taxpayer Field? Federal Reserve Park? Cover the infield with the Henry Paulson TARP? JON WERTHEIM: Last month I attended a New York Mets game at Citi Field; Citi being the TARP-assisted bank that still finds $20 million a year to slather its name on a baseball stadium. The outfield walls are adorned with signs for everything from Verizon to Pepsi. I counted eight logos on the scoreboard alone. My ticket doubled as a coupon for Subway sandwiches. When it comes to sponsorship, the Mets still trail their crosstown rivals, the Yankees. At the new Yankee Stadium, where the Mohegan Sun Sports bar blocks views from the cheap seats, even the home runs are brought to you by Geico. But at Wimbledon? The only logos there are tiny, tasteful representations for Rolex, the scoreboard provider, IBM, stats provider, Slazenger, the ball provider, and Robinson's barley water, the provider of barley water. And while television pays a premium for weekend broadcast rights, Wimbledon not only starts on a Monday, but schedules no play for the middle Sunday so they don't disturb the neighborhood on the holiest day of the week. Why does Wimbledon leave so much money on the table, easily tens of millions a year, when other sporting properties do everything short of look behind bleachers for extra change to boost revenue? When I asked a tournament official, he laughed gently and said, "While there are plenty of offers for sponsorship, if the tournament hung banners behind the baseline or sold naming rights to center court, Wimbledon wouldn't be Wimbledon, would it?" Yes, there's money to be made from having a business sponsor your mascot or from carving out luxury suites. But there's also equity in tradition and dignity. Wimbledon "doesn't do costings" -- that is, make its financials available to gauche journalists -- but profits from 2008 exceeded $50 million. This suggests that protecting the brand, and keeping "Wimbledon, Wimbledon," has plenty of value as well. In short, a sporting event's soul is worth something, too. It sure would be nice if more franchises adopted this philosophy. Even if meant that home runs were to brought us by the actual batter that hit them; not by an insurance company. First among Non-Equals in an Advertising Arms Race? WNYC’s recent story that we mentioned at the beginning of this post also reported that the naming rights advertising arms race is not likely to be productive for the advertisers either, putting them in a position where they are simply playing defense to keep pace with other naming rights deals. In this particular context, that of course presumes that the MTA is about to sell off the naming of the rest of the city subway stations. If it isn’t, it just gave Forest City Ratner a very special benefit. We think that before the MTA starts selling naming rights for subway stations across the city it has some really serious thinking to do about its stewardship of the public realm. If it is to be done (and we don’t think the negatives can be underestimated), it should be done only pursuant to a carefully thought-out set of comprehensive guidelines. There should be time for groups like the Municipal Art Society, which has been concerned with such issues for more than 100 years, to weigh in. We don’t see that this thoughtfulness and comprehensive approach is what actually happened. Instead, we saw what looked like a slaphappy process whereby a very valuable and substantial MTA asset was handed out to a politically favored developer for a fraction of its worth and without regard to the impact on the public. Was this pure carelessness or another example of the extreme predilection of the Bloomberg administration to sell as much of New York’s public realm as conceivably possible to real estate developers for the merest pittance? Addendum, Tomorrow’s New York Times Editorial: Just as we posted this article it came to our attention that tomorrow’s New York Times contains an editorial, Where Geography Matters, June 28, 2009, that opposes the sale to Ratner of the right to name the subways. We are actually very surprised: This is the first time the editorial page has opposed the slightest thing about the Atlantic Yards deal though so much had been highly objectionable and worthy of more than a few editorials. But the Times and Ratner have had a business relationship. When you get off the train at a subway station, you want to know where you are, not who your sponsor is. Names aren’t as easily changed as all that, especially when they correspond — as the names of subway stations do — to the actual geography of the city. The names of subway stations are beautifully utilitarian just as they are, shifting only as rapidly as the streets above them shift. The names of their sponsors are likely to shift with the economic climate . . .
We know that is a goodly sum and times are very tough for the M.T.A. “A goodly sum?” We believe that if the MTA were truly behaving like an agency that was cash strapped it would have negotiated a far higher sum, one that should probably escalate each year. 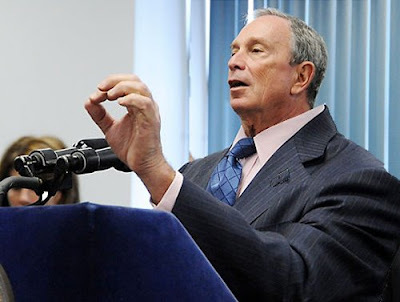 Deciphering Words of a (Campaigning) Bloomberg on Atlantic Yards: “Enough Already” Means, “Bruce, We Have Another $180 Million Plus To Give You! It says a lot about the unpopularity of Atlantic Yards that, even though Bloomberg has a seeming lock on a third term as mayor (given his extraordinary ability to spend on his campaign, mobilizing perhaps a half billion toward that end), Bloomberg still deems it politically prudent to disguise and downplay his support for Atlantic Yards. Ergo, the mayor has basically been dishonest. Case in point? We offer to decipher Mr. Bloomberg’s words. Just weeks ago Bloomberg told the press it was time to turn off the spigot and that no additional public funds should be poured into Forest City Ratner’s Atlantic Yards. What did Bloomberg really mean? He meant that he was about to ram through a deal to give his friend Bruce Ratner more than another $180 million out of the public till. On Wednesday, May 20th the mayor reportedly “dashed Ratner’s hopes for more” money than the “$230 million for infrastructure and land-acquisition costs” the city is putting up for the project. (See: May 21, 2009, Bloomy to Bruce: Enough already, by Mike McLaughlin, The Brooklyn Paper.) This is actually, a typical understatement of the acknowledged cost to the public of the proposed Atlantic Yards. Its true total cost needs to be calculated in terms of billions. That was May 20th. On May 29th it was revealed that a deal was in the works to give millions more, what turns out to be more than $180 million more, to Ratner. That day at hearings on the Atlantic Yards held by State Senator Bill Perkins it was disclosed that there was a deal proposed for substantial additional giveaways to Ratner. Seth Pinsky, president of the New York City Economic Development Corporation (who works for Bloomberg) participated in presenting the parameters of the package of handouts to Ratner and it was announced then that the MTA’s board would be addressing the handouts at its June 24, 2009 meeting. Indeed, that meeting where the MTA, in fact, did approve the handouts occured this past Wednesday, just as then disclosed. Consistent with what was indicated on May 29th, the MTA at that Wednesday meeting approved the more than $180 million in giveaways for Ratner (without any corresponding givebacks, quid pro quos or return obligations from Ratner. In fact, the MTA went so far as to relieve Ratner of obligations to build anything other than the arena and extended to Ratner a low-cost, very long-term option on developing the rest of- the bulk of- the site. That is a blight-inducing (not blight-preventing) decision on the MTA’s part. At the MTA board meeting this week, Mark Page, director of the city Office of Management, and Budget, a mayoral appointee to board working for Bloomberg, did a lot of the heavy lifting to justify the MTA’s approval of the costly sweeteners for Ratner. Mr. Page is in charge of balancing the budget for the city. As quoted above, the mayor had said no more money was to go to Ratner because, "We're going to have a tough time balancing our budget." Does it somehow make it OK that the $180 million plus in additional funds is going to Ratner from the MTA rather than out of the city’s own coffers? That would be to presume that the city, state and MTA budgets are all separate, which they are not. Or might presume that the MTA and state budgets are balanced, which they are not. . .
. . . The MTA board was dealing with another (also contentious) matter this week, which was indicative of just how problematic the MTA’s and the state’s inability to balance their budgets has become. The MTA is having to issue RANs or “Revenue Anticipation Notes,” short-term obligations to provide funds missing from its budget. Those notes will be issued at an extraordinary cost to the MTA, a $4-5 million state bond fee, underwriting and other substantial transaction costs, just because the MTA can’t balance its budget. And one reason the MTA can’t balance its budget is that the state can’t pay funds to the MTA which the state is supposed to and which the MTA is awaiting. That is because the state can’t balance its budget. So you see, these things are all interrelated: There is no free lunch when it comes to picking the pocket of public agencies. And here is one more thing we offer you as interrelated: When Bloomberg said `enough already, we are in hard economic times and there should be no more money given to Bruce Ratner,’ what he really meant was that he had a deal in the works to give Mr. Ratner a huge stack of additional giveaways but that he didn’t want the public to know he was giving an even bigger pile of money to a boondoggle project the public doesn’t like. . . . . the wording on the City Council website is incredibly opaque. It’s as if the powers that be would like to keep the public hearing an insider’s secret so that fewer people will show up. This calendar listing must have gone up today [June 24, 2009], because when I looked last night nothing was listed yet for July 1. Sort of like the way that $180 million+ of additional one-way giveaways for Forest City Ratner (absolutely no quid pro quo give-backs by Ratner) were just approved by ESDC and the MTA with less than 48 hours prior disclosure about what the new terms were. 1. Selling off a portion of the Greenwich Village Historic District (to subsidize St. Vincent’s)- Tuesday at the Landmark’s Preservation Commission. 3. The City Economic Development Corporation has announced condemnation proceedings against Willets Point business and property owners while Article 78 challenge is still pending in court. (This is from a media advisory from Councilman Tony Avella.) EDC has also decided to do this before negotiating with property owners and after telling many of them that negotiations will not start for more than a year.- There will be a press conference and rally in opposition Monday, June 8th at 1:30pm at the Shea Gas Station 127-48 Northern Blvd, Willets Point, Queens. 5. Sacrificing the iconocism of the Brooklyn Bridge for Dock Street- Next Wednesday, June 10th at the City Council. We figure it is meant to be too much to keep up with. Enjoy the summer. The Bloomberg administration no doubt hopes the public will be spending its time on vacation or at the movies seeing action film summer blockbusters. We suggest that next Wednesday, rather than going to the beach, everyone show up to save that great seaside amusement community, historic Coney Island. Saturday, May 16, 2009, City Is Rezoning So Coney Island’s Lower-Income Residents Will Have Place to Buy Back-to-School Shoes, Clothing and Stationery? Right. Sure Thing! Yesterday we promised to disclose today what MTA Chairman H. Dale Hemmerdinger has in his closet and today we will do so. It may have seemed a little bit personal, which is exactly what we intended. When we made our promise we wanted to remind the MTA board members who were about to vote today that the exercise of their fiduciary duty in their role as members of the MTA board is not something that can be compartmentalized and separated from personal honor and integrity. We have no doubt that all the evidence is resplendently stark that the bailout for Forest City Ratner approved* by the MTA board was a wired deal. We think that you would have to be a pretty dim bulb for that not to be clearly apparent. As such, we believe that members of the MTA board voting affirmatively today for all the additional giveaways to Forest City Ratner (the dim bulbs among them excluded) violated their fiduciary duty. This was pointed out by many of the public addressing the board before its vote today, including Assemblyman Jim Brennan, who spoke first and reminded the MTA members that they were lowering the price for the sale of the MTA property without first obtaining an appraisal. The above described sweeteners do not end the list of what the MTA members approved for Ratner today. Not only did the MTA provide Forest City Ratner with these freebies (there was no corresponding quid pro quo where Ratner agreed to give something back in exchange) without getting the appraisal to which Assemblyman Brennan referred (or planning ever to do so in the future), the MTA did so without testing the market for alternative developers interested in the site. In fact, when today Develop Don’t Destroy Brooklyn actually offered to pay the $120 million for the MTA property (vs. the Ratner $20 million and lesser capacity railyard proposal) the board did not even mention or discuss the DDDB offer before it voted. Would alternative developers be interested in paying more for the MTA railyard property than Forest City Ratner? The MTA would like to say that such would not be the case. But they never put the supposition to the test and approached no one else. ESDC and the MTA are also promoting certain expedient fictions (like the idea that Atlantic Yards will be built within ten years rather than multiple decades) in order to avoid legal problems. The idea that there would not be any other interested alternative developers if the MTA ever inquired is one of those fictions important for the board’s breach of fiduciary duty not to be more blatantly obvious. Would alternative developers (other than DDDB) be interested in paying more for the MTA railyard property than Forest City Ratner? We strongly believe such eager developers are actually out there champing at the bit. This we believe is a bigger story we will have to return to at another time. MTA Chairman Dale Hemmerdinger had a sour look on his face. No one on the board seemed to looking directly at Goldstein. In very short order after Mr. Goldstein spoke Chairman Hemmerdinger left the room leaving the chairing of the meeting to another board member. Presumably, Chairman Hemmerdinger left to make a call to whomever was coordinating and orchestrating for the governor (or mayor). The moment was reminiscent of one that occurred on Monday at the MTA Finance Committee meeting when (at 1:20 P.M.), just after the Atlantic Yards portion of the meeting, Chairman Hemmerdinger Chairman Hemmerdinger and Gary Dellaverson, the MTA’’s Chief Financial Officer (who “negotiated” the Ratner deal and presented it at the meeting arose on tandem and jointly left the room while meeting was still in progress. On Monday, Chairman Hemmerdinger returned after about 10 minutes and Mr. Dellaverson did not. Chairman Hemmerdinger subsequently returned for the rest of the Wednesday meeting as well. "Fiduciary relationships have often been described as 'special relationships,' for good reason. Generally, '[a] fiduciary relationship is a situation where one person reposes special trust in another or where a special duty exists on the part of one person to protect the interests of another.'" One non-voting member of the MTA (Norman Brown) said that he found it patronizing to have to be told exactly how fiduciary duty is defined though this is something that even attorneys will look up when they intend to carefully advise a client. In essence, his argument had gone off the rails, the MTA was supposed to vote only in its own interests. We wrote yesterday about how we do not believe the politically colored events of today can be separated from other things personal and professional. What does Chairman Hemmerdinger have in his closet? Chairman Hemmerdinger is a human being much like ourselves. It so happens that he owns one of our favorite neckties (see the image above). On Monday, when were we were at the MTA waiting to make our statement to the MTA’s finance committee, Chairman Hemmerdinger approached us to comment appreciatively on our necktie and inform us he had the same one at home . . . presumably in his closet. 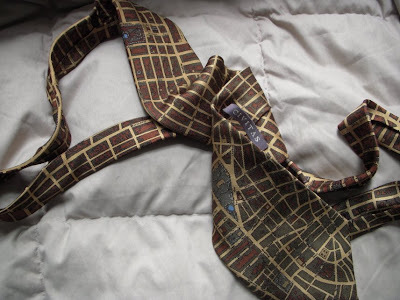 We think of it as an urban design tie (it has on it a print of a New York map) and we think it ought to be worn by people who care about the city. In 1981, when CIVITAS was founded, August Heckscher, its first chair, hearkened back to the Roman Republic to find a name that would express the spirit of the new community organization. The name chosen, "CIVITAS," referred to that quality of a citizen that made him deeply involved in the life and fate of his city. Such has been the guiding spirit for CIVITAS ever since. Perhaps Civitas will be concerned with what is happening at Atlantic Yards since Atlantic Yards is now draining the coffers of the MTA even further. After all, every citizen cares about funds for mass transit. “Civitas” derives originally from the term used to describe Roman citizenship. We will think of it in terms of the qualities of civility and duty to your fellow citizens required for civilized communities to work. We do not believe that the actions of the MTA board today can be considered consistent with those qualities or civil obligations. Our necktie would be a lot less interesting if the New York streets on it were eliminated. Similarly, Brooklyn will become a much more desultory and less interesting place if Atlantic Yards is built. It would ruin the “fabric” of the city both figuratively and literally. We may have things in common with Mr. Hemmerdinger, but we think that in making his decisions today and leading the board through its mistakes Mr. Hemmerdinger was driven by ties other than what we have in common. We also think that what was done today was so egregious that we don’t expect this MTA debacle to be over. In other words, don’t expect that everything has been put away and will stay in the closet. As one can see, there are in these activities a great many situations where Mr. Hemmerdinger has significant fiduciary duties and other responsibilities wherein others need to put faith and trust in him. Inevitably, these are all connected just as even our honesty in dealing with our families also relates to such things. We noticed that Develop Don’t Destroy was recently offering a new metaphor, describing Atlantic Yards as a “Zombie Project.” (See: Nets, Ratner, Yormark Desperately Trying to Market Zombie Project, posted: 6.04.09.) The idea behind that, of course, is that the strange political forces that keep re-animating Atlantic Yards don’t seem to recognize when a natural death and permanent grave rest under the lilies is appropriate. We can offer a quibble on the zombiefication of the project. When it comes to zombies, we had previously declared the developer, Forest City Ratner, to be the “zombie,” not the project. Thursday, March 19, 2009, Willets Point Lawsuit Points Out . . .
Tuesday, March 31, 2009, Looking at Things From Another Point of View: Do We See Distinctions That Make A Difference? The kind of “zombie subsidy bear-hug” we were referring to is the kind of thing the MTA and ESDC are now getting into with the financially ailing Forest City Ratner (the developer has a speculative credit rating of B1 and a stock value that has been at zero). Both agencies are looking to bail out the developer with a package of sweeteners on Atlantic Yards, the value of which is substantial. It starts with the $100 million in value with respect to the MTA railyard capacity that the zombie developer will be excused from providing, plus the $80 million the MTA won’t be collecting from Ratner for its land in the MTA’s time of financial need. There is a lot more sweetener with other benefits not being provided in the foreseeable future and timetables and deadlines being deferred. For starters see: Tuesday, June 23, 2009, Thoughts on the MTA’s Finance Committee Meeting Wherein Atlantic Yards Was Considered as an “Information Item”. 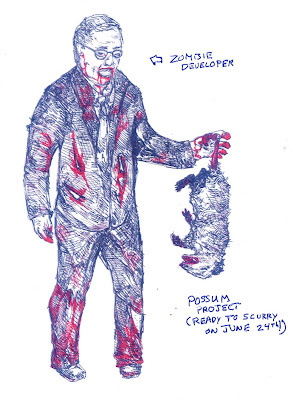 What we also refer to when we use the term “zombie subsidy bear-hug” is what Raul Rothblatt was talking about when he testified this morning at the ESDC board meeting. ESDC voted to approve the sweetening package for Ratner, worth however many hundred million dollars. Before they did, however, Mr. Rothblatt asked the ESDC board members what possible subsequent request from Ratner they would ever be able to refuse in the future if they approved this one. Probably none. That’s the nature of the hug. The developer-zombie metaphor actually has a very respectable antecedent in economics. Essentially we derived it from the term “zombie bank” used by commentators such as Paul Krugman. The term refers to insolvent banks that should go out of business but are propped up by the government. First talked about in terms of the Japanese financial crisis that dragged on for years, zombie banks are generally thought to be a rather bad thing that prevents the economy from acting normally and with its usual vigor because economic incentives for proper performance get all bollixed up. The living dead parade around confusingly in what should be the land of the living. Welcome to the world Governor Paterson and Mayor Bloomberg are fashioning for us. We also described the project as Dracula, a desicated corpse frying in the sunlight of public scrutiny that is still not truly dead until a stake has been put through its heart, its head has been cut off and its mouth stuffed with garlic. We called for responsible politicians to affirmatively kill the project. For this see: Wednesday, May 6, 2009, City Council Races (33rd and 39th CDs): Candidates’ Positions on Development and Effective Action They Would Take to Stop Atlantic Yards (Part II). The vampire description has also been applied to developer Bruce Ratner himself. At the community protest when the Brooklyn Museum “honored” Bruce Ratner, there were signs and chants that “Ratner is a vampire” referring, no doubt, to his willingness to enervate the community by sucking on its blood for his own sustenance. Is Ratner the vampire, or his project? Is the developer the zombie, or the project? This gets into the classic conundrum of how the monster can often be confused with its creator. When we hear “Frankenstein” do with think of the monster or Dr. Victor Frankenstein who created it? Frankenstein might, in fact, be a another good metaphor for the project since it is such a stitch-together pastiche of dead and improbable promises robbed from the musty tombs that hold so many past ill-conceived megadevelopment projects. We can imagine the laboratory where efforts are made to jolt the cobbled together monstrosity to life using Marty Markowitz’s silly boosterism as energy. Maybe though the vampire metaphor is a good one to stick with in light of all the recent changes in the proposed monopoly-megaproject. We have seen the departure of Frank Gehry and Laurie Olin, replaced by an incredibly different low-rent design team. Vampires have the power of lycanthropy, the power to shape shift into other animals (yes, similar to werewolves). Perhaps that serves well because these days the moral with Atlantic Yards is that even though it is guaranteed to be something terrible, it is changing around a lot. It has no real defined shape so that if our public officials launch it there is no telling what we might one day actually get. What’s Up At Dock Street, Really?